You see this window if you selected at least two devices and click the Start RAID button in the device list. At this stage you need to specify the RAID recovery parameters. RAID0 or RAID10. If you deal with a RAID10 array, you may specify all the disks you have since ReclaiMe Pro can discard mirror copies. That’s why the Automatically detect and exclude mirrors (recommended) option is always enabled for a RAID10. RAID recovery is fully covered in the recently published Logical Data Recovery book where you can find various aspects of data recovery from different RAID arrays. Automatically detect and exclude blank drives (recommended). 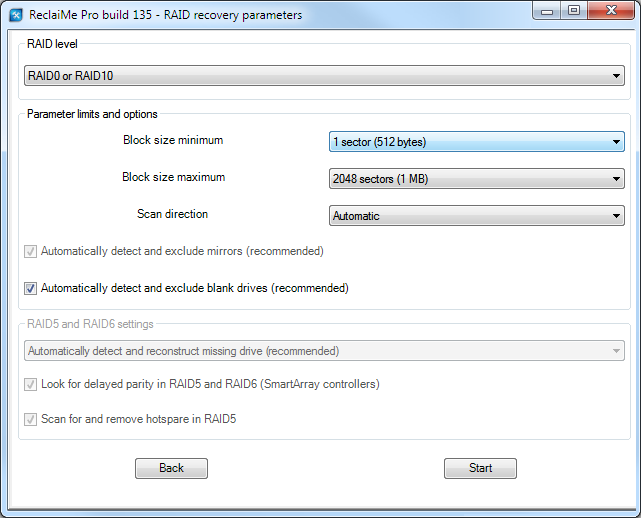 Minimum and maximum block size parameters set a range within which ReclaiMe Pro looks for the correct RAID block size. The wider the range, the more time it takes to detect the correct solution. So if you know for sure the block size used in your RAID, just set this value for both parameters to speed up the RAID recovery. The Scan direction tells ReclaiMe Pro in what direction it should scan RAID data to detect the correct RAID configuration parameters. For example, if you are using automatic scan and do not get the result for a long time, it makes sense to try forward direction in the hope that ReclaiMe Pro gets faster to the data based on which it can generate the correct set of RAID parameters. The last two parameters - mirror and blank drives detection - are advisable to have enabled during the first run. When you re-run RAID recovery on the same set of drives, you can unmark these parameters given that you exclude the mirror and blank drives yourself based on information ReclaiMe Pro provided on the first run. It is safe to do so because on the second and subsequent runs ReclaiMe Pro does not reveal anything new about the set of drives but spends time for the analysis. In this group there are additional parameters which you can use for RAID5 and RAID6. Automatically detect and reconstruct missing drive. In this case ReclaiMe Pro conducts a series of tests to detect whether there is parity data among user data. If the tests show that the parity does not match, ReclaiMe Pro automatically adds a missing disk to the set of RAID disks. One drive is missing – reconstruct it. In this case ReclaiMe Pro adds a missing drive immediately, without any tests. All drives are available – do not look for missing drive. Mark the Look for delayed parity in RAID5 and RAID6 (SmartArray controllers) option if the array comes from the HP SmartArray controller. This slows the RAID recovery somewhat, so you may want to disable it with a typical Intel, LSI, and Adaptec RAID5. If the Scan for and remove hotspare in RAID5 option is marked, ReclaiMe Pro, before starting, conducts the series of tests to detect a hot spare disk. If you restart the software you may unmark this option to save the recovery time given that you have excluded a hot spare disk yourself.